The De-luxe edition is covered in gold blocked Skivertex simulated leather, also with dust covers and in original dark green marbled cover slipcases. Surrey: Ashford Publications, 1996 & 1998. Both Volumes have over 250 pages each, over 500 colour photographs by David Cousins.Size 210 x 300mm. Nine aspects of each instrument and two of each bow are shown with measurements. Where relevant, details are included in the text accompanying each subject with translations into German, French, Italian and Japanese. Condition as new - OUT OF PRINT. Vol 1 records a unique collection of stringed instruments and bows. It contains 30 fine Italian instruments plus 40 French and English bows which are illustrated with over 250 colour photographs. Amongst others: Mantegazza, Giovanni and Paolo Grancino, Giuseppe Rocca, Alessandro Gagliano, G.B. Guadagnini, Giuseppe 'filius Andrea' Guarneri and Carlo Tononi. Vol. 2: This handsomely produced volume records a unique collection of stringed instruments and bows. It contains 31 fine English, French and Italian instruments plus 65 English bows which are illustrated with over 350 colour photographs. 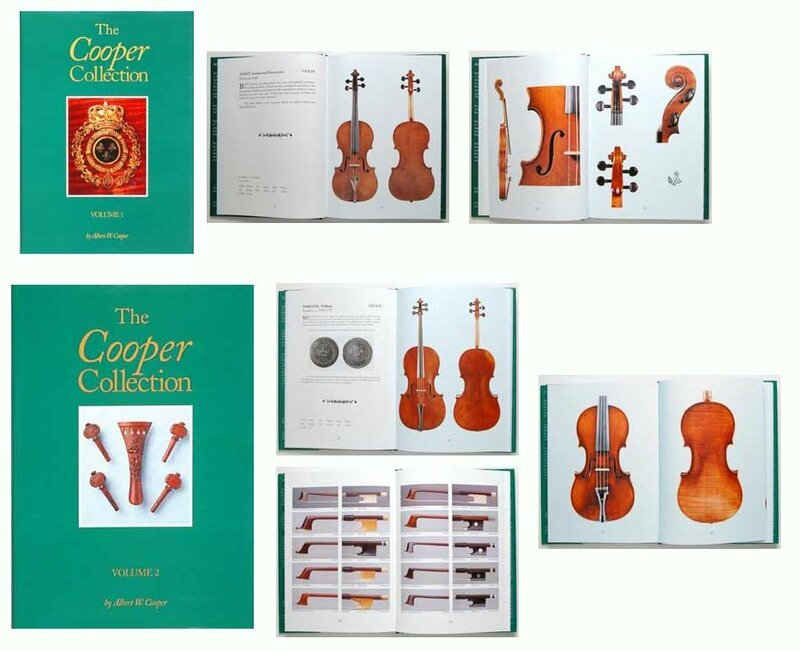 Both volumes: Nine aspects of each instrument and two of each bow are shown with measurements. Where relevant, details are included in the text accompanying each subject with translations into German, French, Italian and Japanese.